French design studio Faltazi has developed a plug-in funnel to upcycle urine and bring an eco message to summer festivals. "Are you used to going for a number one in the back of your garden?" asks French design studio Faltazi. "Do not waste this valuable golden fluid by sprinkling on inappropriate surfaces!" 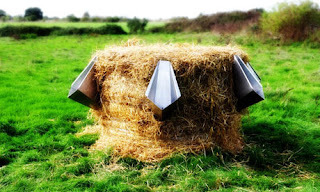 Their solution to the problem of peeing al fresco is l'Uritonnoir, a hybrid of a urinal ("urinoir" in French) and a funnel ("entonnoir") that plugs into a straw bale to make your very own urine upcycling factory. As the bale is filled with your "liquid gold", the nitrogen in the urine reacts with the carbon in the straw to begin the process of decomposition - forming a rich mound of composted humus within 6-12 months. L'Uritonnoir was originally dreamt up with summer festivals in mind, where straw bales are often in frequent supply, but portaloos are not. The device comes as a flat polypropylene sheet, which is folded into shape and slotted together, then threaded on a looping band around the bale, its funnel wedged deep into the centre of the straw to channel the fluid to the composting core. A deluxe version is also available in stainless steel - presumably for the VIP bale urinal area.